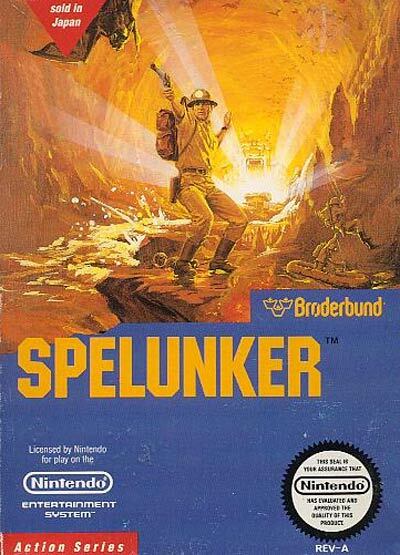 Spelunker is set in a colossal cave, with the player starting at the cave's entrance at the top, and the objective is to get to the fabulous treasure at the bottom. To achieve this, the player must walk and jump through increasingly challenging parts of the cave, all the while working with a finite supply of fresh air, which could be replenished at strategic points. Numerous natural dangers abound within the cave, such as water, uneven terrain, steam vents, small ledges, chasms, deadly pits, and large rocks that must be blown away. To make matters even worse, the cave is home to large bats, which drop deadly guano on you. Finally, a ghost of a long-dead failed spelunker haunts the cave. Every now and then, it comes out of hiding, looking to take you to the shadow world. By pressing the spacebar (B button for NES version), the player character makes a strange wisping gesture with his hands (uses a flash gun in the NES version), expelling the ghost away. However, this renders him immobile for a couple of seconds, thus vulnerable to other dangers. Objects to collect include sticks of dynamite, flares and keys (which come in two different colours). By pressing the "D" key, a stick of dynamite is dropped and ignited. This can be used to blow away big rocks. Flares are launched with the "F" key and are used to scare bats away.